There comes a point in every creative’s journey where they experience burnout. Burnout is defined as the feeling of physical and emotional exhaustion, due to stress from working with people under difficult or demanding conditions. Burnout is followed by signs such as chronic fatigue, quickness to anger and suspicion, and susceptibility to colds, headaches, and fevers. Sound familiar? All entrepreneurs can fall victim to burnout, but those of us who exchange time for money are the most likely to burnout. We can’t imagine taking a day off because we only get paid for the work we produce. Knowing that the work has to get done so you can eat, you stay glued to your computer hustling. It’s time to reclaim your time! You don’t have to exchange time for money and can absolutely get paid while you rest. Know that you aren’t limited to the one-on-one services. You can spend the same time serving multiple clients and making more money. Let’s dive into how you can scale your business by moving from a one-to-one business model to one-to-many. Where was my dream client 1-3 years ago? What could she have used to get her to where she is today? Where will my dream client be in 1-3 years? What will she need to get sustain her business? You can create recurring services or retainer services to offer past customers. Akilah’s clients may benefit from a Site Maintenance Subscription or Monthly Google Analytics Reporting. Both of these services are less time consuming than her signature service and allow Akilah to scale her business. 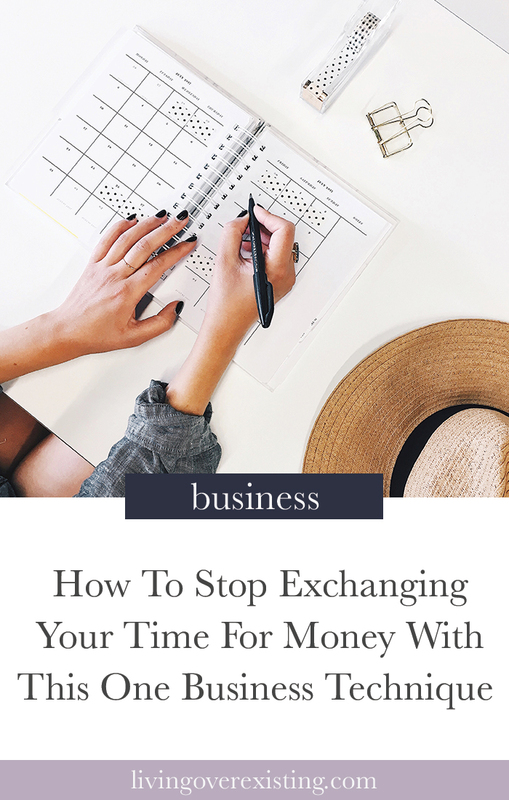 You don’t have to exchange time for money and can absolutely get paid while you rest. Still stuck on ideas? Let’s look at information models that allow you to serve more clients in less time. A masterclass is taught by a master of that discipline and these classes are generally one-off special events. What are you a master of? Think on that and offer that to your audience. Need real life examples? Let’s take a look at Luna. Luna’s a wiz at InDesign, Photoshop and Illustrator. She can reach and educate many online entrepreneurs by showing them how to use Adobe like a pro. The price will be cheaper than her 1:1 services BUT she can spend only 1-3 hours with more people vs. the 10+ hours it can take to design for one client. Like other 1-to-many business models, Luna can work with less clients, gain more work-life balance, and will no longer be driven by client deadlines. Instead, she can choose when she hosts a class. A membership is a business model where members who join can access the content, events or other value you provide for a recurring fee. Memberships can be hosted on a site in which a member logins and can access exclusive content, special offers, and even be part of a community of other members. Or can simply be a community with exclusive access. You don’t have to spend time creating content for a membership site either, you can offer services or masterclasses inside of your membership. The only requirement for successful memberships is that it must offer value, quality and convenience. Many creatives focus on doing the work for clients or providing them tools and sending them on their way to complete. A happy medium is done-with-you service. Wondering what a done-with-you service is? A personal training session is a prime example. The trainer creates the workout, shows up to the gym with the client and is right by their side, but the client has to actually do the work. The trainer is providing their expertise. How can you incorporate this into your business? Offer a one-day service or course with a live component to execute one part of the whole. I’ve seen “Design in a Day” offerings from designers in which the designer provides a do-it-yourself template and spends 4-5 hours with the client discussing conversion strategy and SEO. This model works great online and even better in person. Yes, no matter your business, you can host a workshop, too. By changing your approach, you can spend less time with your clients and make more money. Instead of being burned out by hustling to gain more clients, begin to focus on reclaiming your time and scaling your business. In doing this, you’ll find that you have more time to spend with your family and on other parts of your business all while making more money. Rita is an Educator, Owner and Creative Director, of Heydays Design Studio. She teaches web designers how to run their design biz with ease, get visible & have fans more loyal than the BeyHive. Visit her website.